Joe Fresh is a household name here in Canada. This brand, which started in Toronto in 2006, has been the go-to for wardrobe basics, lifestyle collections and affordable fashion for families cross the nation. I have pieces from the Joe Fresh straight-size line, which runs up to an XL, that I swear by which made me absolutely ecstatic when I heard they launched a plus size collection. Joe Fresh has made the very welcome decision to bring these same wardrobe building block essentials to plus size consumers, making the brand even more accessible. I put together 3 different looks with styles from the new collection to show you how I'm bringing Joe Fresh into my fall closet. Cold-Shoulder Dress | Just because the weather is getting cooler doesn't mean we have to abandon the fun, flirty looks we loved in summer. Bringing cold shoulders, bold prints and flirty dresses into your fall wardrobe will make sure vibrancy is added to your looks this season. I love the lightweight versatility of this dress and look forward to adding stockings and a turtleneck as the weather gets cooler. Paired with my new fav Michael Kors cross body bag and colourful sandals, this look makes me feel like it can be summer all year long. Moto Jacket + Pintuck Print Sleeveless Blouse in Navy | A moto jacket is a must in every fall wardrobe. They are the perfect layering piece and add the finishing touch to even the most casual look. I paired this vibrant, lightweight moto with the pin tuck sleeveless blouse to create a casual look perfect for transitioning into fall. Sizing note - this line definitely fits big. I am a size 18/20 and decided to size up to a 3X so I would be able to wear this over a chunky knit sweater. I could have easily done so with a 2X and a 1X would have been the correct fit for this look - so I would size down for sure! 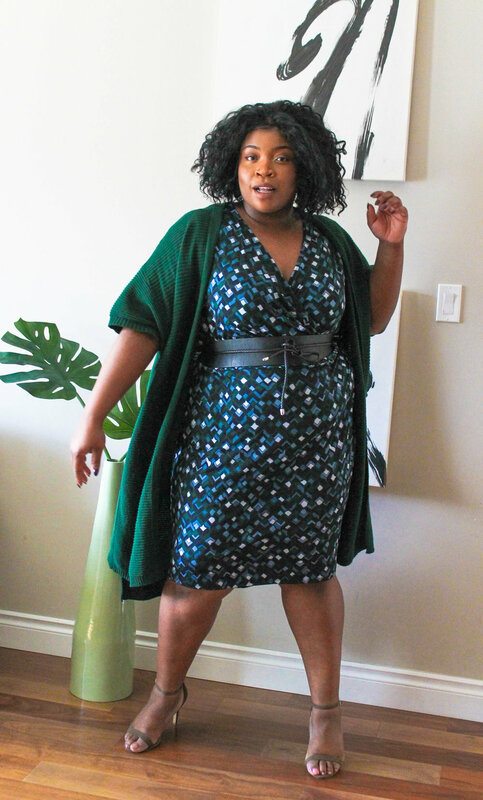 Open Short Sleeve Cardi in JF Jag Green & Print Wrap Dress in Jade | I am a huge proponent of being as cozy as possible for work. I work 12 hour shifts so even the cutest look can get very old very fast if it isn't comfortable. This show sleeve cardi is both warm and stylish, making it the perfect pairing for a wrap dress to add an air of professionalism. With a belt to create a cinched waste and scrappy kitten heels, this look is an awesome way to stay warm at work this season. This is a sponsored post; however, all thoughts and ideas are my own.